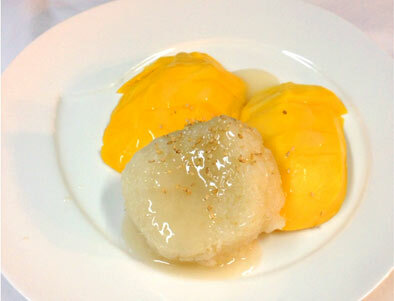 Steamed sticky rice with warm coconut milk and ripe mango. Steamed purple sticky rice with warm coconut milk and Thai custard. Deep-fried banana (wrapped in spring roll) with a scoop of vanilla ice cream, whipped cream, and honey. Deep-fried vanilla ice cream wrapped with special bread. Green tea with ice cream.